The new Multifort Dual Time provides welcome convenience for travellers – offering twice as much freedom thanks to the Caliber 80 with GMT function, which have been combined in a Mido model for the very first time. This reliable and sophisticated timepiece is protected by a sturdy black PVD-treated round case, and equipped with a stunningly attractive black dial decorated with wide vertical Geneva stripes. In the centre of the watch, the second time zone is indicated by an orange varnished hand in a nod to the Mido colours. The Multifort Dual Time has a distinctly masculine character, and is the ideal timepiece for those seeking to cross time zones with elegance and accuracy. Launched in 1934, two years after the Sydney Harbour Bridge was completed, the Multifort collection shares the structure’s remarkable qualities – a perfect blend of functionality and beauty. This year, Mido celebrates the 85th anniversary of Multifort production, making this one of the longest-produced collections in the history of Swiss watchmaking. 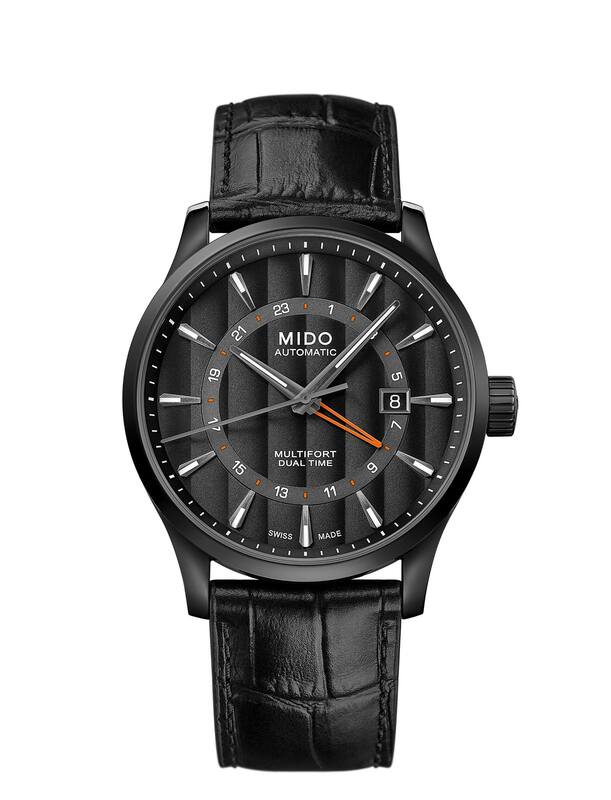 Entirely in black with subtle touches of orange that recall Mido’s identity, the new Multifort Dual Time adds a classy touch to travellers. Its latest-generation automatic movement – the Caliber 80 with GMT function, which is making its Mido debut – provides both flawless accuracy and up to 80 hours of power reserve. Travellers can also set the second time zone, which is located in the centre of the dial and indicated by an orange varnished hand. The sturdy round black PVD-treated steel case measures 42 mm in diameter, while its wide vertical Geneva stripes are a hallmark of the Multifort collection and evoke the suspension cables on Sydney Harbour Bridge, which was a symbol of architectural modernity in the early 1930s. To guarantee perfect readability at night, the indexes and the three-sided hour and minute hands – diamond-cut and satin-finished in the centre – are coated with white Super-LumiNova®. Featuring an anti-reflective treatment on both sides, the sapphire crystal protects the Multifort Dual Time’s dial and ensures perfect readability. An aperture at 3 o’clock displays the date. 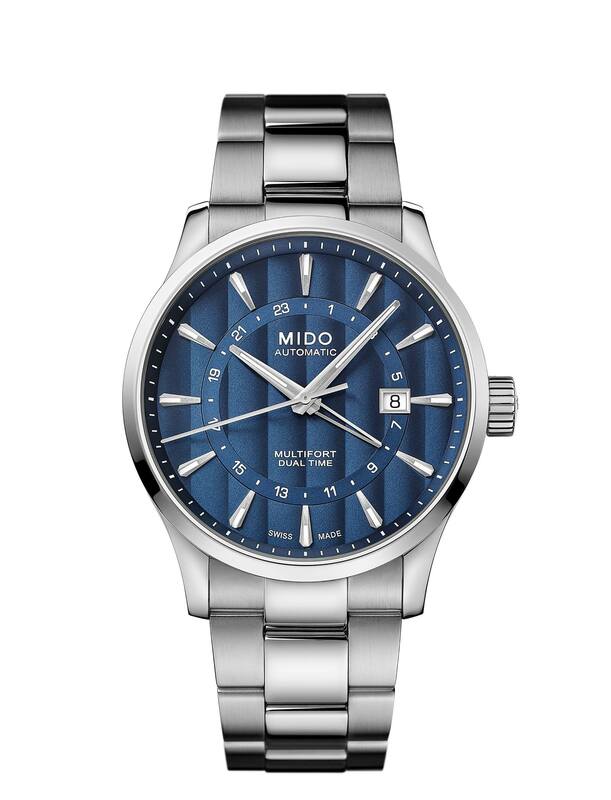 Thanks to its transparent case back, users can admire its finely decorated automatic movement as well as its oscillating weight adorned with Geneva stripes and the Mido logo. Water-resistant up to a pressure of 10 bars (100 m/330 ft), the Multifort Dual Time is fitted with a strap in black semi-matt crocodile-look genuine cow leather, with a folding clasp in black PVD-treated steel. Two other versions of the Multifort Dual Time – one all-steel, the other featuring a rose gold PVD treatment and a leather strap – are also available. 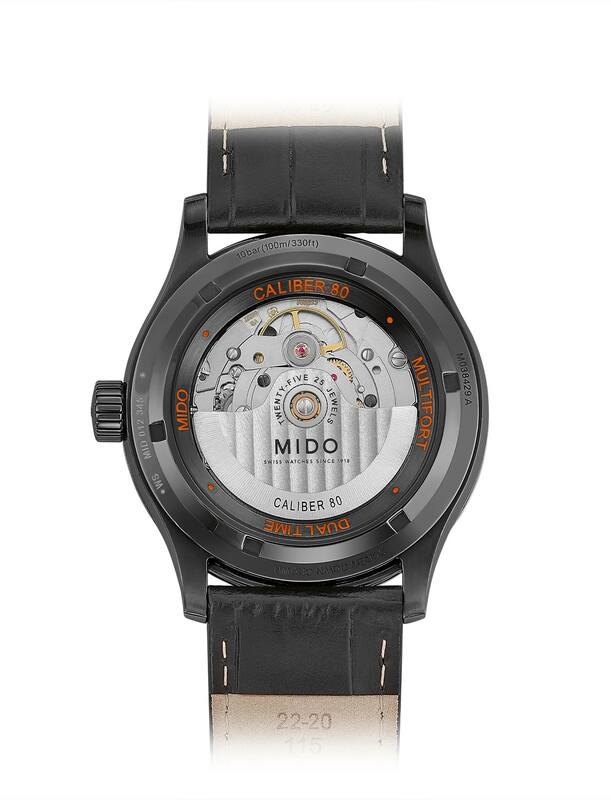 Automatic Mido Caliber 80 (ETA C07.611 base), 11½’’’, Ø25.60 mm, height: 5.77 mm, 25 jewels, 21,600 vph. 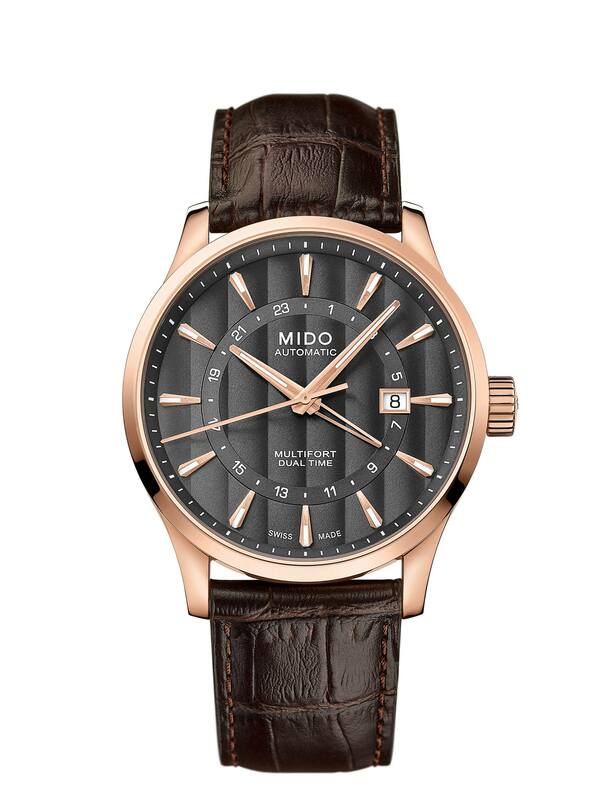 Finely decorated Elaboré-grade movement, oscillating weight decorated with Geneva stripes and the Mido logo. Functions: HMSD + GMT 24H. Adjusted on 3 different positions for high accuracy. Up to 80 hours of power reserve. 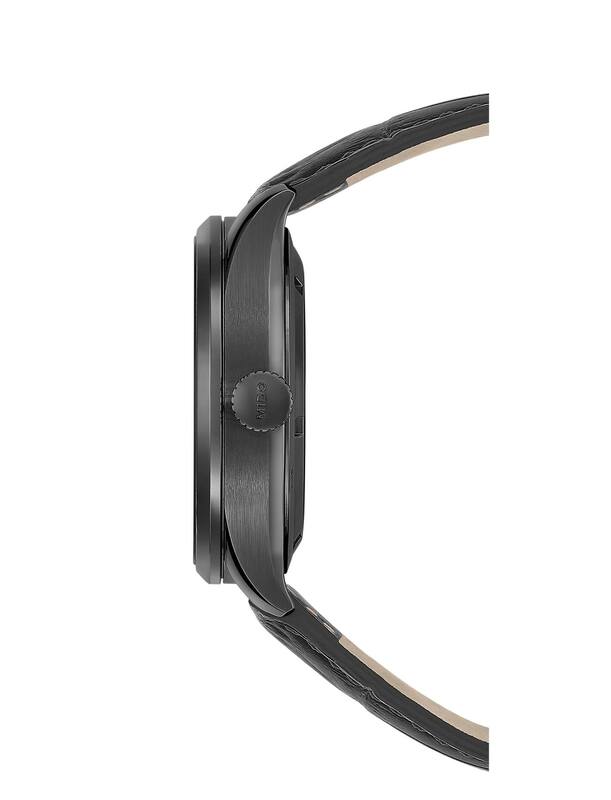 Black semi-matt crocodile-look genuine cow leather, folding clasp in 316L stainless steel with black PVD treatment. Black, vertical Geneva stripes, individually applied faceted indexes coated with white Super-LumiNova®, date at 3 o’clock. Applied second time zone, centred, delicately sandblasted with touches of orange. Three-sided hour and minute hands (diamond-cut and satin-finished in the centre) coated with white Super-LumiNova®, diamond-cut seconds hand and orange varnished second time zone hand.